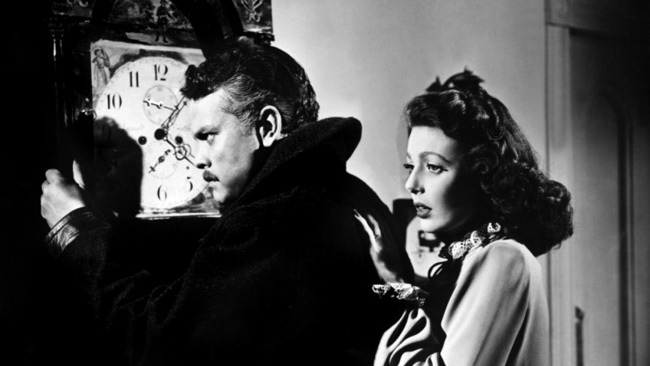 Film Chest’s HD Cinema Classics label, through Virgil Films, issued the classic Orson Welles’ film The Stranger for the first time on Blu-ray on Feb. 15, 2011, as part of a two-disc Blu-ray/DVD combo pack . The set came out the same day as the Blu-ray debut of another exemplary film noir, 1946’s Kansas City Confidential. The great Orson Welles (Touch of Evil, Citizen Kane) directs and stars in The Stranger. He plays Nazi war criminal, Franz Kindler, who has assumed a new identity following World War II. Now known as Charles Rankin, Kindler is a professor at a prep school, residing in a quiet Connecticut town with his new American wife, Mary (Loretta Young, The Bishop’s Wife), the daughter of a Supreme Court Justice. Meanwhile, Mr. Wilson (Edward G. Robinson of Five Star Final, Soylent Green), an agent from the U.N.’s War Crimes Commission, is relentless in his obsession with tracking down Kindler and exposing his lurid secrets. Like Film Chest’s Blu-ray of Kansas City Confidential, The Stranger was been digitally restored in high-definition from original 35 mm film assets. It’s presented with its original mono audio track as well as a new 5.1 surround sound mix. Special features include a collectible postcard reproduction of the original movie poster and a before-and-after film restoration demo. The Blu-ray/DVD combo pack carries a list price of $15.99.